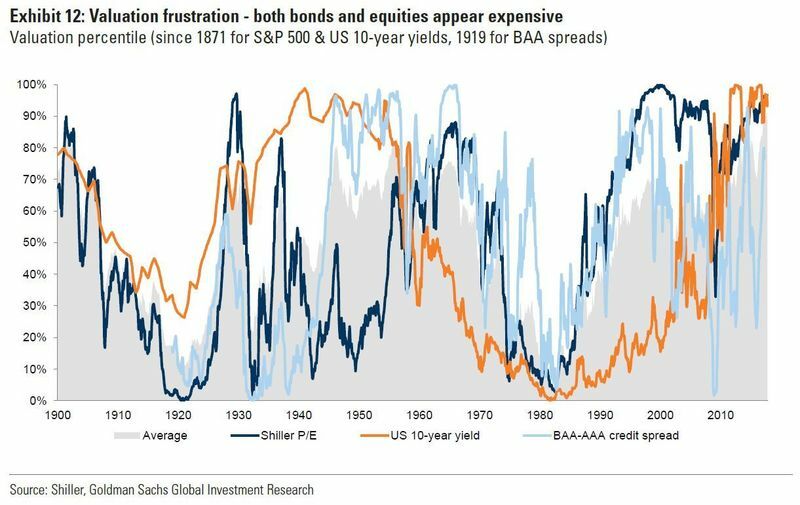 A prolonged bull market across stocks, bonds and credit has left a measure of average valuation at the highest since 1900, a condition that at some point is going to translate into pain for investors, according to Goldman Sachs Group Inc.
A portfolio of 60 percent S&P 500 Index stocks and 40 percent 10-year U.S. Treasuries generated a 7.1 percent inflation-adjusted return since 1985, Goldman calculated — compared with 4.8 percent over the last century. The tech-bubble implosion and global financial crisis were the two taints to the record. In the Goldman strategists’ main scenario of lower but positive returns, investors should “stay invested and could even be lured to lever up.” They suggested putting more in equities, with their greater risk-adjusted returns, and scaling back duration in fixed income. The exceptionally low volatility found in the stock market — with the VIX index near the record low it reached in September — could continue. History has featured periods when low volatility lasted more than three years. The current one began in mid-2016. Valuations have a “mixed track record” for predicting returns, explaining less than half the variation since 1900. Major draw-downs in 60/40 portfolios over the past century amounted to 26 percent in real terms on average, lasting 19 months. It took two years to get back to previous peaks, on average. Bonds are probably less good hedges for equities nowadays — a point also made by Pacific Investment Management Co.
Central banks “might not be able or willing to buffer growth or inflation shocks,” especially if they judge that imbalances and excesses are building. They also face fewer options to ease monetary policy given low rates and big balance sheets.